Tree Speak | Casey Trees: WHAT ARE CITIES DOING TO PROTECT TREES? It's hard to be a city tree. You get weed whacked, knocked by card doors, have power lines all up in your business - it's nonstop. However, cities including DC are making changes for the better. 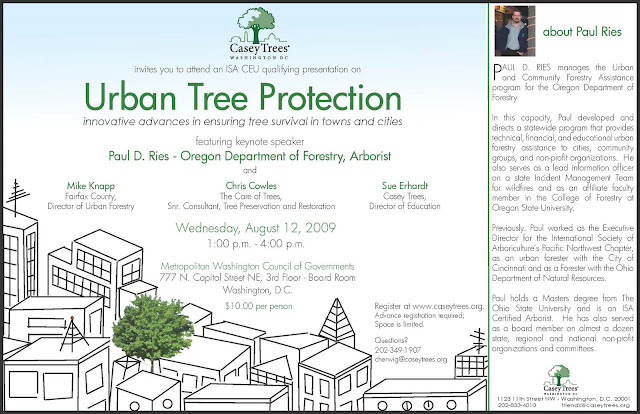 On Wednesday, August 12 (1 - 4 p.m.), Casey Trees is hosting a special lecture profiling how towns and cities are protecting urban trees. They keynote speaker - Arborist Paul Ries - is all the way from Oregon but the DC metro area is well represented by Mike Knapp (Fairfax County), Chris Cooks (Care of Trees) and our very own Sue Erhardt (Casey Trees). The class is only $10.00 per person and is a win-win for individuals looking for ISA credits - Urban Tree Protection qualifies. Whether you are an arborist, developer, landscape architect, or just someone who values trees, this class is for you. Spots are still available but going quick. Advance registration is required. To register, click here.